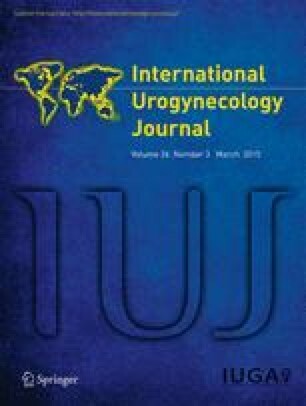 The aim of this study was to compare the results of primary anterior vaginal wall prolapse repair, using standard anterior colporrhaphy or non-absorbable mesh in a routine health care setting. The study was based on prospectively collected data from the Swedish National Register for Gynaecological Surgery. All patients were operated on solely for primary, anterior vaginal wall prolapse between January 2006 and October 2013: 6,247 women had an anterior colporrhaphy, and in 356 a non-absorbable mesh was used. Data were collected from doctors and patients up to 1 year after surgery. The 1-year cure rate for the mesh group was superior to that of the colporrhaphy group with an odds ratio (OR) of 1.53 (CI 1.1–2.13), corresponding to a number needed to treat (NNT) of 13.5. Patient satisfaction, OR = 2.45 (CI 1.58–3.80), and patient improvement, OR 2.99 (CI 1.62–5.54), was also higher in the mesh group. However, patient-reported complications, OR = 1.51 (CI 1.15–1.98), and the incidence of persisting pain in the loin, OR = 3.58 (CI 2.32–5.52), were also higher in the mesh group as were surgeon-reported complications, OR = 2.27 (CI 1.77–2.91), bladder injuries, OR = 6.71 (CI 3.14–14.33), and re-operations within 12 months, OR = 6.87 (CI 3.68–12.80). Mesh reinforcement, in primary anterior vaginal wall prolapse patients, enhanced the likelihood of anatomical success at 1 year after surgery. However, mesh implant was associated with a significantly higher incidence of bladder injury, reoperations, both patient- and surgeon-reported complications, more patient-reported pain and a longer hospital stay. This study was supported by the Swedish Association of Local Authorities and Regions. Emil Karl Nüssler is responsible for the register of prolapse surgery of the Swedish National Register for Gynaecological Surgery. Mats Löfgren is chairman of the National Register. The authors alone are responsible for the content and writing of the paper. Nüssler EK (2013) Use of implants in genital organ prolapse surgery Sweden 2006–2012. the Swedish Gyn-op register homepage. http://www.gynop.org/doc/ppt/Implants_NUGA2013_EN.pptx. Accessed 13 February 2014.